This article provides brief explanations of the scientific basis behind each point so that you can master them for your own climate change communications. Ninety-seven percent of scientists agree that humans are causing climate change. The climate has always changed, but recent global warming is unprecedented in all of human history. We know that the Earth’s climate changed over time through evidence left in the fossil and geologic record, known as proxies. Biological proxies—tree rings, pollen, corals, forams and diatoms preserve evidence in their remains of changes to atmospheric composition over time, which can be dated using radioactive dating. Ice cores give us a year-by-year record of the chemical composition of the atmosphere. Rocks, sand dunes, glacial debris and other geological proxies leave their mark on the land and help to establish sea levels, glaciation extent, and land features in different time periods. Thus, scientists can paint a clear picture of what the climate was like going back millions of years. The Earth’s climate has always changed, sometimes drastically. Four and a half billion years ago, when life first appeared on Earth, the Earth was a hot place blanketed by an atmosphere rich in carbon dioxide (Steffen et al. 2004). But the uprising of continents and proliferation of plant life drew carbon dioxide out of the atmosphere and the climate began to cool. During the Mesozoic era, which began 250 million years ago, the Earth was 5 degrees C warmer than present; dinosaurs roamed the earth and tropical plants grew in high latitudes (Steffen et al. 2004). The Earth began to cool again around 50 million years ago and hemisphere glaciations began around 2.7 million years ago (Steffen 2004). The glaciated cold periods alternated with non-glaciated warm periods in cycles of 41,000 years. The last ice age ended 15,000 years ago, making conditions favorable for human civilization (Steffen 2004). Since then, during the Holocene, temperatures have fluctuated between warm and cool times, sometimes for thousands of years, but overall the climate has been stable compared to previous eras (Figure 1). 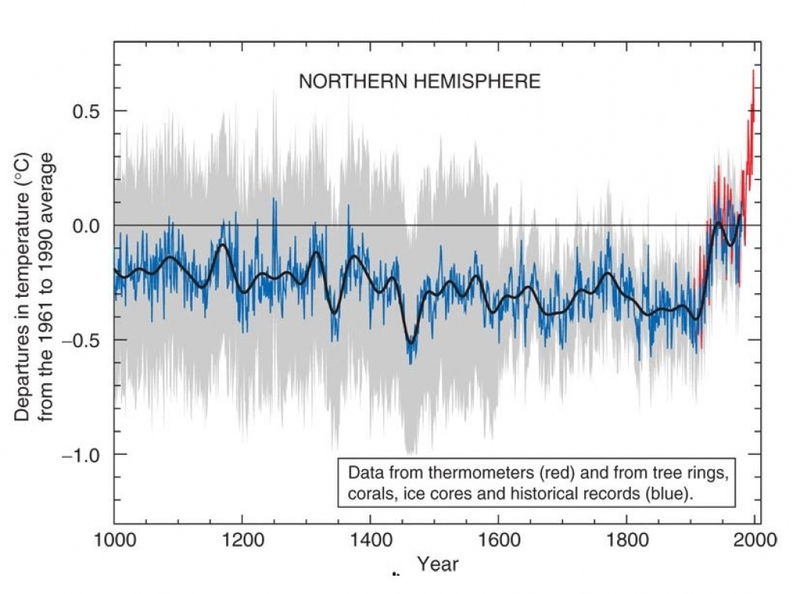 Scientists have detected a clear warming trend in the last one hundred years. Earth’s temperature in the Northern Hemisphere from 1983 to 2012 was likely the highest in the last 1400 years (Figure 2), and the global average surface temperature is 1 degree warmer than it was in 1880 (IPCC 2014). Human activity, primarily the burning of fossil fuels, is the main contributor to global warming. Another myth is that climate change is part of a natural cycle and human activity isn’t really the main contributor. Climate change is a complex phenomenon influenced by many factors, both natural and anthropogenic. The sun obviously plays a large role, as does Earth’s position in relation to it. During cycles of 100,000 years, the Earth’s orbit around the sun is more elliptical, which brings it closer to the sun during some parts of the year than others. The Earth’s tilt as it rotates around its axis also changes, from 21.8 degrees to 24.4 degrees about every 41,000 years. When the tilt is more pronounced, as it is currently, summers are hotter and winters are cooler in higher latitudes. When the tilt is less, summer sun may not melt winter ice, making an ice age more likely. The Earth’s axis also changes as it rotates in a cycle of about 26,000 years, which changes its relative position to the sun. Warming is also caused by increasing greenhouse gases in the atmosphere, a phenomenon known as the greenhouse effect. These gases include carbon dioxide, methane, sulfur oxides, nitrous oxides, water vapor, and hydroflurocarbons. Both natural and human processes affect how much greenhouse gas is in the atmosphere, but humans have been the major contributor in the last hundred years, mainly from burning fossil fuels. Since 1750, human activity is estimated to have contributed 2,040 gigatons of carbon dioxide to the atmosphere (IPCC 2014). About half of those carbon emissions have occurred in the last 40 years (IPCC 2014). This level of greenhouse gases in the atmosphere is unprecedented in at least the last 800,000 years (IPCC 2014). The evidence that human beings are contributing to climate change is conclusive. The current warming trajectory will cause severe, pervasive, and irreversible impacts for people and ecosystems. Climate change is predicted to create “severe, pervasive and irreversible impacts for people and ecosystems” (IPCC 2014). Warming temperatures will cause sea levels to rise 30-100 cm by 2100, which would cause major problems for low lying areas (IPCC 2014). Some tropical islands, such as Maldives and Tuvalo, would become uninhabitable and their inhabitants will become refugees (Chemnick 2017). Cities like Shanghai and Miami would be flooded. Scientists at the non-profit organization Climate Central estimate that 275 million people live in coastal areas that will be submerged by sea-level rise (Holder et al. 2017). Climate change would make storms more intense and frequent, like the one that dumped 19 trillion gallons of water on Houston, Texas in five days in 2017 (Goodell 2017). Droughts would also be longer and more pronounced. Warmer temperatures also increase vector-borne diseases. Rates of malaria are five times higher than they were in 1990, and one study estimates that a 1 degree Celsius increase in average global temperature could raise the number of people at risk for dengue fever by up to 47 percent (Colón-González 2014). Climate changes in the past have had devastating impacts on civilizations, as Jared Diamond and other scholars show. The Anasazi, which lived in modern-day Arizona, built a civilization in a fragile ecosystem frequently afflicted with drought. After centuries of deforestation and environmental degradation, the Anasazi were finally desolated by a severe drought starting in the year 1130. The civilization finally collapsed in mid or late 12th century (Diamond 2003). Evidence also suggests that droughts contributed to the collapse of the Mayan civilization in the years 760-910 (Diamond 2003). In Europe and North America, the Little Ice Age (16th to 19th centuries) brought about mild cooling, which nevertheless led to frigid winters and droughts. Losses in agricultural productivity, coupled with growing population in Europe contributed to witch hunts and the French Revolution (Fagan 2001). Thus even small changes in temperature can have drastic impacts that change the course of human civilization. We can stop climate change, and many of the solutions are inexpensive and have benefits other than reducing greenhouse gas emissions. While climate change has caused the collapse of civilizations in the past, modern societies have advantages that ancient societies didn’t to help reduce the damage and suffering. For one, modern science provides an increasingly accurate picture of what the climate will look like in the future, so that we can avoid the undesirable. Second, globalization distributes resources so that shortages in one region can be supplemented by goods from another region. Third, we have the technology and the institutions in place to implement solutions. In Project Drawndown, Paul Hawken enlisted researchers from around the world to research one hundred of the most effective climate solutions to climate change already in existence and calculate their monetary cost and their potential for reducing climate change (Figure 3). The number one solution, refrigerant management, has the potential of avoiding 89.7 gigatons of carbon dioxide over 30 years, and an international agreement is already in place to phase out the use of HFCs (“Refrigerant Management”). Reducing food waste and shifting to a plant-rich diet could reduce emissions by 136 gigatons (Hawken ed. 2017). Family planning and education for girls would have huge benefits besides reducing the population, and neither draconian policies nor expensive technologies are necessary to convince women to have fewer children (Hawken ed. 2017). A powerful (and low-cost) solution that would drive emissions reductions throughout the economy is a carbon price. In this solution, a price is put on fossil fuels at the source, which fossil fuel extraction companies have to pay, and the revenue collected can be used to reduce other taxes or distributed back to households as dividends. The Energy Information Administration conservatively estimates that a $25 per metric ton price on carbon dioxide implemented in 2015 and increasing 5 percent a year would reduce emissions 32 percent below 2005 levels by 2030, enough to meet the US targets in the Paris Climate Agreement (Kaufman et al 2016). The policy would enable emissions reductions to be achieved wherever it is most efficient to do so, resulting in the greatest impact at the lowest cost, and with less bureaucracy than command-and-control regulation. The dividends can offset higher energy costs for low-income households, create jobs, and stimulate the economy (Kaufman et al 2016). The organization that I work for, Citizens’ Climate Lobby, empowers individuals to lobby members of Congress to enact a carbon fee and dividend legislation. These five key facts are all we need to understand that we need to change course on climate change. In addition to reducing greenhouse gas emissions, we need to protect ecosystems and ensure that we have a safety net to adapt to changing conditions and provide for the needs of future generations. The histories of other societies show that the way societies respond to environmental problems determines whether they die or survive. The solutions are at our fingertips; all we need is the resolve to use them. Chemnick, Jean. “Island Nations Urge Aggressive Action at U.N. Climate Meeting.” Scientific American, November 9, 2017. https://www.scientificamerican.com/article/island-nations-urge-aggressive-action-at-u-n-climate-meeting/. “Climate Change 2014: Synthesis Report. Contribution of Working Groups I, II and III to the Fifth Assessment Report of the Intergovernmental Panel on Climate Change.” Geneva, Switzerland: Intergovernmental Panel on Climate Change, 2014. https://www.ipcc.ch/report/ar5/syr/. Colón-González, Felipe J., Carlo Fezzi, Iain R. Lake, and Paul R. Hunter. “The Effects of Weather and Climate Change on Dengue.” PLoS Neglected Tropical Diseases 7, no. 11 (November 14, 2013). https://doi.org/10.1371/journal.pntd.0002503. Cook, John, Naomi Oreskes, Peter T. Doran, William RL Anderegg, Bart Verheggen, Ed W. Maibach, J. Stuart Carlton et al. “Consensus on consensus: a synthesis of consensus estimates on human-caused global warming.” Environmental Research Letters 11, no. 4 (2016): 048002. Diamond, Jared. Collapse: How Societies Choose to Fail or Succeed. Penguin, 2005. Fagan, Brian. The Little Ice Age: How Climate Made History 1300-1850. Basic Books, 2001. Goodell, Jeff. “Houston: A Global Warning.” Rolling Stone, August 31, 2017. https://www.rollingstone.com/politics/features/hurricane-harvey-houston-flood-is-climate-change-warning-w500596. Hawken, Paul, ed. 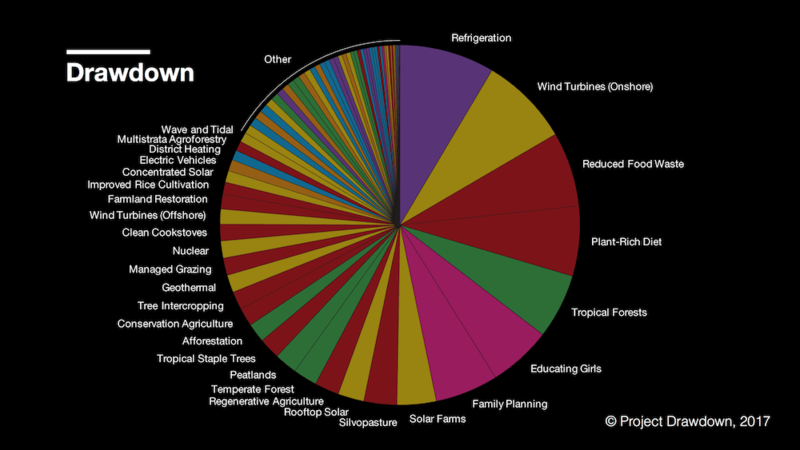 Drawdown: The Most Comprehensive Plan Ever Proposed to Reverse Global Warming. New York, New York: Penguin Books, 2017. Hoggan, James. Climate Cover-Up: The Crusade to Deny Global Warming. Greystone Books Ltd, 2009. Holder, Josh, Niko Kommenda, and Jonathan Watts. “The Three-Degree World: Cities That Will Be Drowned by Global Warming.” The Guardian, November 3, 2017, sec. Environment. https://www.theguardian.com/cities/ng-interactive/2017/nov/03/three-degree-world-cities-drowned-global-warming. Kaufman, Noah, Michael Obeiter, and Eleanor Krause. “Putting a price on carbon: reducing emissions.” World Resources Institute Issue Brief. January. Washington: World Resources Institute (2016). “Refrigerant Management.” Drawdown, February 7, 2017. http://www.drawdown.org/solutions/materials/refrigerant-management. Steffen, Will, et al. “Planetary Machinery: The Dynamics of the Earth System Prior to Significant Human Influence.” In Global Change and the Earth System. New York: Springer, 2004. “Yale Climate Opinion Maps – U.S. 2016.” Yale Program on Climate Change Communication, 2016. http://climatecommunication.yale.edu/visualizations-data/ycom-us-2016/. Well written, timely and coherent. Thank you. Nice article, I found point 3 particularly interesting! I have seen firsthand people capitalising on this point – that climate change may be happening, but humans are not responsible. Not too long ago these same people firmly posited that climate change is a hoax. Now, with mounting evidence and its existence being affirmed, the whole “its a hoax” well has run dry. And, so these people have adapted. They continue to walk party lines on the issue, but do so in a way that allows them to acknowledge climate change while continuing to ignore it: “Climate change is real. But, the input of man is questionable”. Thanks! Unfortunately by the time they acknowledge its real and human caused, it may be too late.